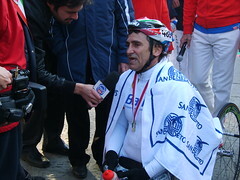 45 year-old Alex Zanardi, former Formula One driver wins a gold medal in the paracycling event at the Paralympics, Wednesday, September 5, 2012. You can read about his remarkable recovery and return to an elite level of competition here in this Globe and Mail article. – Danika Kirka for the Globe and Mail, from London.